Whenever you access cards in Archives, you may remove 1 card in Archives from the game, instead of accessing it. A black box that makes data disappear forever. The time for the unloved Interface may just be here. Corp recursion right now is stronger than ever. With Architect and Crick, those trashed Campaigns and Grids were already bouncing back with painful regularity, and now Team Sponsorship is proving itself the breakout card of the latest pack. License Acquisition and Interns are not unknown, either, and with Data and Destiny just around the corner, feel free to get a pre-emptive strike in against those persistent currents that New Angeles Sol: Your News likes to keep in play (although that still likely requires you to play your own current for theirs to be in Archives at the right time). Alternatively, annoyed that your Datasucker tokens are being prevented by a Cyberdex Virus Suite that's been trashed? Eliminate it for good and let your counters pile up once more. And even if the Corp isn't running any of those tools? You can still get rid of whatever they're most likely to want back when Jackson Howard hits the table. No filtering those Snares! through R&D again, Chairman! On the other hand, it's still an expensive piece of hardware that doesn't directly help you steal Agendas. It's also in Anarch, and if you're not Anarch yourself, there's an awful lot of good competition for your influence points in other Anarch cards. But still. If you're tired of having to rummage up yet another five credts because SanSan City Grid is back AGAIN? Maybe this is your answer. For a long time, this was a bad card. I mean, sure, you could hit a Jackson Howard that you trashed, or maybe Subliminal Messaging, or make it a lot harder for Cerebral Imaging: Infinite Frontiers to combo off. Or limit Architect/Team Sponsorship options. Or avoid some ambush, like Cyberdex Virus Suite or News Team or Space Camp in there. Nice, but not particularly important. And you had the occasional Industrial Genomics: Growing Solutions matchup, but who techs against that? Only that one guy played IG, and it was pure jank. No need to spend a whole card slot on that one theoretical matchup. But then Museum of History and Mumba Temple were printed. And then Bio-Ethics Association/Mumbad City Hall, and suddenly everyone's playing Industrial Genomics: Growing Solutions/Gagarin Deep Space: Expanding the Horizon. What's a runner to do? Sure you can run archives vs IG, but then you eat net damage from Shock! and/or Hokusai Grid. You can trash the assets, but they're expensive, you can't trash all of them, and Museum of History just gets them back into the deck, plus Hostile Infrastructure makes you take net damage for trashing them. Archives Interface puts you back in the driver's seat. Avoid and eliminate all those pesky Shock! 's in archives. Get rid of cards forever, before Museum of History brings them back. Trash stuff and then REMOVE THEM FROM THE GAME. Stop the recursion cycle. Ideally, you're already playing anarch (which at least half of players are, right now), and already have a way of trashing things, like Whizzard: Master Gamer or Noise: Hacker Extraordinaire (two already very popular ID's right now.) Just slot one of these in, and suddenly that matchup is so much easier. You already dig through your deck at a prodigious rate with Wyldside that I can only assume you're running, so you'll get that singleton fast enough to matter. And when it's a dead card, toss it to Faust. Or, if you're that concerned about the matchup playing Shaper (pretty much everyone else,) you can use Artist Colony to grab this. When the metagame changes, adapt. Wake up, Archives Interface, wake up and smell the ashes. A couple possibilities come to mind for this card, the first of which is protection against traps such as Cyberdex Virus Suite, Shi.Kyū and Shock!. Also great for removing cards that the corp was counting on shuffling back into r&d, such as Jackson Howard and other trashable assets. This could definitely see play in Noise mill decks, turning every run on archives into a chance to remove very valuable cards from the game. While this card was never seen until recently in tournaments it got being slotted since Combo Decks like CI7 (and other CI Combo Decks, like this Hasty CI) & Railgun are strong. As well as Industrial Genomics: Growing Solutions and Jinteki: Potential Unleashed. And as cards like Friends in High Places are used by almost every deck. Some of the strong decks are slotting it is as a one of and it can become a match winner. It goes along with the ICE Destruction from the current Whizzard: Master Gamer and the ParaSifr combo (Parasite, Şifr). As it can remove the ICE from the game so a reinstall is not possible any more if it's with Friends in High Places or shuffled back with Jackson Howard or similar cards. Often it's paired with Salsette Slums as this removes all trashed cards from the game and is paired with Temüjin Contract as this rewards running on Archives and as a bonus you may remove a card. And you might use it to load your Datasucker. Against Combo Decks you can remove important cards as: Accelerated Diagnostics, Reclamation Order, Interns, Jackson Howard, BOOM!, Biotic Labor as Archives is often used to park them to be used after a Power Shutdown. When they are not expecting you to have Archives Interface you can surprise them and may be able to interrupt the combo which usually leads to the win. Against the Industrial Genomics: Growing Solutions and Jinteki: Potential Unleashed you can use it to clear Shock! and Shi.Kyū so there is not much left that will prevent you from running Archives beside Caprice Nisei. And to stop them from reusing Data Mine and Marcus Batty again and again and again with Friends in High Places. The Bonus is of course that you can remove Operations such as: Hedge Fund, Restructure, Scorched Earth and others from Archives. This results sometimes in the weird situation that Archives becomes empty. This card's time is coming. It's nice that it puts a crimp in corp recursion, but let's be blunt: That's almost never going to matter, because the corp usually has a lot of things they wouldn't mind bringing back. If you're running archives enough to put a noticeable dent in their recursion plans, then you're probably running archives too much. The place where this is necessary is as a defuser of archive traps. Cards that currently fire when accessed from archives include Shock!, Space Camp, Shi.Kyū, News Team, TGTBT, Explode-a-palooza and Award Bait. And I imagine that even more cards will show up as time goes on. As of this writing (Just before Data and Destiny arrives), corps are just starting to realize how amazing their third central server can be when properly seeded. Industrial Genomics decks are finally beninning to come into their own, and Haarpsichord Studios is starting to give them a run for their money, in the race for "who can have the nastiest archives." I truly believe that this card is an important safety-valve against corp deck-archetypes that are only just starting to manifest. Its time may not be yet. It might not even be this year. But archives-based corps are only getting stronger, and at some point not too far off, this card is going to become a strong meta-counter. • Break the endless recursion of Museum of History. • Protect yourself from scary Archives traps like Shi.Kyū Shock! and Cyberdex Virus Suite. 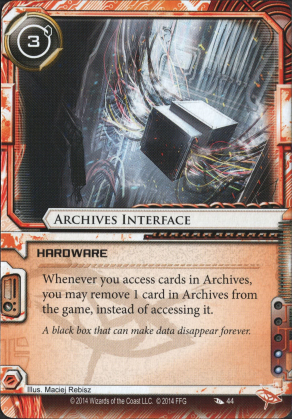 The CVS interaction is specifically useful for Anarchs running this card, asit protects your Datasuckers, making it safe to run on Archives again.